All of this is from Russia’s Sputnik News, that allegedly “William Stevens told RIA Novosti.”Western news services are citing that Russian source as the sole source in their own reporting of the matter; and no denial has yet been issued by the U.S. government. If the allegation is true, then the U.S., “in early March, » was demanding “Assad’s departure,” despite there being no participation of the Syrian people in that decision — no new election in Syria, much less Assad’s losing any such election; and, yet, Mr. Brennan was demanding this, “in order to facilitate a transition that reflects the will of the Syrian people,” somehow (despite there being no democratic process whatsoever). The Obama Administration favors breaking Syria up into sectarian enclaves: Alawite-Shiite, versus Sunni, versus Druze, versus Kurd. This would be essential in order to permit Saudi Arabia to build an oil pipeline into Europe through the Sunni part of Syria, and Qatar also to build a gas pipeline through the Sunni part of Syria, both in order to get their (U.S.-corporate-backed) oil and gas into Europe, so as to replace Russia’s main market for its oil and gas, which is the EU. 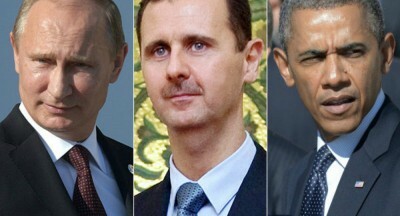 Clearly, American involvement in the political process in Syria is unwelcomed, if not loathed, by the Syrian people. They don’t want the U.S. to continue supporting the jihadists who are destroying their country; and they also don’t want the U.S. dictating that Bashar al-Assad will stop being their leader. None of these facts are brought up by any of the moderators in the U.S. Presidential candidates’ debates. However, some of those moderators are on my email list for all of my news-reports (which have covered all of these matters), and therefore it would seem unlikely that the reason for the matter’s not being covered — at all — is that they are ignorant of the reality. The explanation must be something other than ignorance.